1.12.1 Follow Us on Facebook! What if I told you getting a good GRE score is not a tough task? All you need to do is find the right GRE prep Material, and you will be able to prepare for GRE exam and get an excellent GRE score. These GRE Prep Books won’t cost you thousands of dollars. In fact, you can get these study guides for under $100 each. Learning from the best GRE Prep Book that provides quality instruction and matches your learning needs is the quickest and most cost-effective way to a great GRE score. But even finding a “good” GRE study book can take hours of research. That is why I have created a list of the best GRE study material for 2019. After reading all these books carefully and researching their sales performance, here are the options I have shortlisted as the best of the best. Magoosh Magoosh's Complete Guide to the GRE 500 NA FREE! 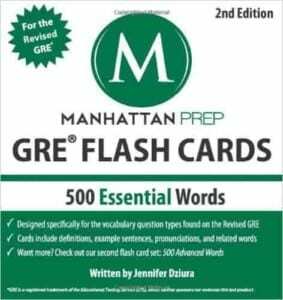 The Manhattan Prep GRE study guide is a comprehensive set of eight GRE textbooks designed by Manhattan Prep. Six of these books take care of the quantitative portion, and the last two address the verbal section. The six quantitative strategy books are tailor-made for someone who is beginning their preparation from scratch and has absolutely no idea about the patterns or language of GRE mathematics. By digging into each and every topic from the basic level, these books clear any misconceptions one might have about any of the topics you may be tested on. As a result, this is ideal for those who have been out of touch when it comes to quantitative portions. The two verbal GRE study books also offer some excellent test-taking strategies. Although you won’t see a lot of practice questions in these guides, the strategies discussed are worth noting and can save some real time if effectively implemented. Much of the GRE has to do with recognizing cues in how questions are written and passages are constructed, so the exposure from these review books will go a long way in preparing you adequately. All in all, Manhattan Prep has provided one of the best and most comprehensive preparation books on the market. Cost-wise, it is slightly on the higher side but provides a more comprehensive amount of material than most. This Official GRE super power pack bundle provides three books in one, in a convenient and low-cost package: The Official Guide to the GRE, 3rd edition; The Official GRE Quantitative Reasoning Questions, Volume 1, Second Edition; and The Official GRE Verbal Reasoning Questions, Volume 1, Second Edition. 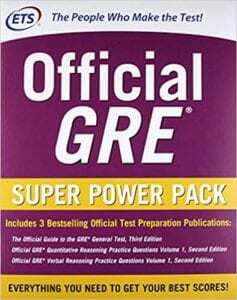 These GRE Prep Books are created by the creator of GRE (ETS), which in itself is a huge bonus for students. The Quantitative Reasoning book is filled with quantitative practice questions and answers, as well as (occasional) explanations and strategies for tackling each question type. One of the main pros that results from the guidebook being written by ETS is that the difficulty level is almost same as that of the actual GRE. Preparing properly for the GRE is as much as matter of being adequately challenged as learning the right strategies and material. Similarly, the Verbal Reasoning GRE prep Book contains practice questions that are sources from previous administrations of the GRE, providing readers with a good feel for the test. This package also contains a CD-ROM, which includes a free GRE practice test—this in itself is a vital feature and something that not all textbooks provide. Some of the problems may feel overly complicated, due to the fact that there is more emphasis placed on practice than instruction, but this is largely the general trend with physical GRE prep books. Using this book and the accompanying online program has been an excellent experience for me. It helped me to go from sweating about the test and dreading studying boring page after page to becoming a person who can commit to studying and understanding. What immediately hits you is that this book provides down-to-Earth examples. Everything is spelled out in plain English so that the materials are readily accessible and easy to understand. It doesn’t sound like it was written by your 5th-grade algebra teacher (snore). It has some of the best examples from the GRE and advice from expert test takers to go along with an awesome online course that makes studying fun. Overall, it’s a perfect fit for someone who hates taking tests (read: everyone). It isn’t perfect, but it is a great value for your money and perfect for someone who needs a simplified way of studying. Here’s what you will like and what might give you a headache if you’re a picky studier. 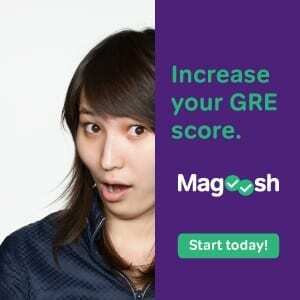 Note : I have written a full review of Magoosh’s GRE prep course. 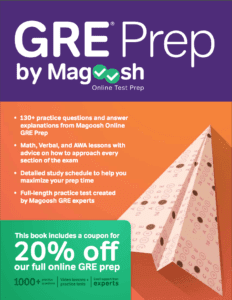 Note : I have written a full review of Magoosh’s GRE prep course here. This isn’t your typical GRE prep book, which drills you with questions until your brain turns to mush. Instead, it offers a practical guide that makes it easy to organize a successfully study plan. It puts you on the right track from the very start with a carefully thought-out study schedule which starts on the day you open the book and finishes the day you pass the test. It couldn’t get any easier! Here are some other unique ways this book will simplify your studies and prep you for the big test. Tips and FAQs– The first thing you need to know is what you’re getting into (“What?! I need to know math for this test?!”). Magoosh has compiled some of the top questions and answers from past test takers to calm your nerves and let you know exactly what to expect. Expert Questions from Expert Tutors– Once you have your bearings, they get straight into it with 130+ questions designed and analyzed by expert GRE tutors. Not only can you test yourself with the questions but they even provide in-depth explanations and statistics to help you measure the difficulty level (and your progress). Teaching, Not Just Testing– Yep, it’s time to end your post-grad couch potato phase and get learning again! Comprehensive chapters on all the parts of the test work to teach you what you need to know instead of just making you run the gauntlet of question after question. There’s even an extra chapter on the analytical writing category to turn your chicken scratch into Shakespeare. Practice (Testing) Makes Perfect– One complete practice test with answer key is provided and includes detailed explanations for all the answers. It’s just what you need to see if you’re ready for the real thing (as long as you check the answer key after taking the test!). As you can probably tell so far from the review, I think this book is fantastic, but in the spirit of leaving a balanced review, and in recognition of the fact that everyone has different priorities, here are some things might leave you a bit less than thrilled. The Online Program Isn’t Included– The Magoosh online program is a companion to the book (and I’d highly recommend it), but it isn’t included with the book. The good news? The book comes with a coupon for 20% off the full online package. A Bit Light on the Questions– Because of the higher focus on teaching, this book has fewer exam questions than some others, which might be a problem for you if you’re looking for a test prep book that just contains a ton of questions and a key. Well, there are my thoughts on the Magoosh GRE Test Prep book. It may not be perfect, but for my money, there’s no better way to plan, study, and conquer the big test- especially when coupled with their online prep course. As a former tutor for the GRE test, I have been through dozens of prep and review books in my time. 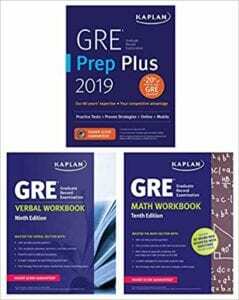 With that in mind, let’s review Kaplan’s most recent addition to the GRE prep book arena: GRE Prep Plus 2019. Let’s start off with one of the most important features that has been added in Kaplan’s most recent additions: access to online tests that you can complete on your computer, tablet, or even mobile phone! I cannot stress how important doing an online test on a computer is going to be for your test success. Unlike the SAT and standardized tests that you have probably taken already, the GRE will be taken at a test center on a computer. Being able to familiarize yourself with the test environment and testing method will pay off huge dividends on test day. It’s clearly written and laid out and will definitely provide you with the information you need to get ready for your test. Questions respond to your performance on the GRE, meaning they get harder as you continue to do well, and ease up when you make mistakes. Famliarizing yourself with such a unique method of testing is a major part of effectively preparing. Overall, this textbook is amazing for anyone who wants to be really well prepared and is interested in taking a bevy of practice tests beforehand. This book is an extremely well-guided piece that doesn’t bore you to death. Everything you learn along the way is applied in the online tests that are provided, making it much easier to retain the information. Multiple ways to learn the information– Kaplan understands that different people learn best through different mediums. Whether you prefer reading, watching, or even talking one-on-one, Kaplan has all those. Yes, that’s right, in addition to the book you are also given access to online videos that explain every facet of the test along with one-on-one tutoring with Kaplan teachers. These are game-changing additional features for any textbook. Well Sorted Questions– The layout is extremely clean. Every question in the textbook is categorized, and more importantly, comes with a difficulty rating to help you practice. Home in on questions that you feel comfortable with, and flag more difficult ones for returning to once you are a bit more comfortable. Tests on Tests– One thing you will not feel any need for, is more practice tests. You have access to banks of tests both in-book and online. Note: Kaplan has one of the best GRE prep courses in the market. Cost wise it is expensive but it’s totally worth it. Read my full review to learn more about Kaplan GRE prep courses. Note: Kaplan has one of the best GRE prep courses in the market. Cost wise it is expensive but it’s totally worth it. Learn more about Kaplan GRE prep courses. Lacking in Math– I found the mathematics portion of the book to lack the in-depth teaching that the other sections offer. While it certainly does teach you all the techniques required for the GRE, it seems to rely on teaching it to you through rote memorization of formulas rather than a true understanding of the concepts in the problem. While this may work well for 95% of problems, the GRE loves to try and throw you off your rhythm and not knowing the derivation of your formulas could easily to lead to time-consuming problems on the real test that were better avoided. 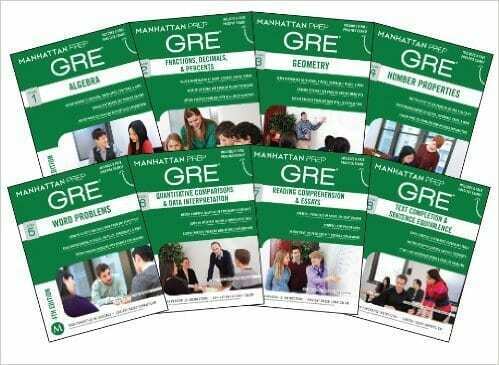 A comprehensive GRE study guide designed by Manhattan Prep. This GRE book has loads of questions which cover both the verbal and quantitative part. At the end of the book, you also have responses to a lot of topics for the analytical writing assessment. This book is splendid when it comes to the Reading Comprehension part but misses the mark if you’re looking for solid practice for Text Completion and Sentence Completion. The words given in the question are abstruse and are not tested anymore in the latest GRE pattern. So, for the verbal section, just stick to the Reading Comprehension. For the Quantitative part, this is probably the best GRE prep book you’ll find on the market. This textbook covers mathematics topics as extensively as any book can and has brilliant explanations after the end of the questions too. This combination of practice problems and instructional explanations is critical for making sure that you are internalizing the material. Questions are also classified according to difficulty (Easy, Medium, Hard), which should help you judge where you stand. There’s also an “Advanced Quant” section which is, of course, tougher than the real GRE, but if you’re looking for something above GRE just in case to be prepared for the worst, then you can practice that as well although, that’s completely your choice. Some of the more abstract questions in the advanced section can help your brain recognize obscure patterns in standard questions. Overall, this book is perfect for quantitative practice but leaves a lot to be desired when it comes to Verbal. At the end of the book, you have responses to a lot of AWA topics as bonus. The GRE is designed by ETS ( Educational Testing Service ). So, when ETS comes up with a book, it might serve you well to take a peek! 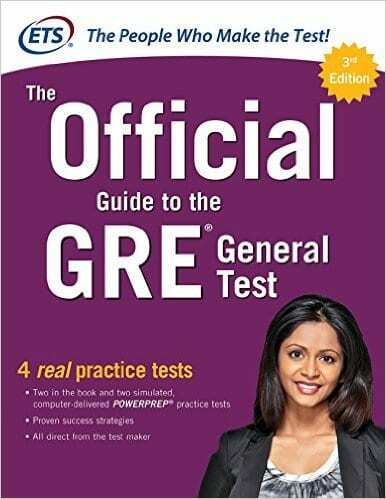 This test prep book primarily contains all the conventions which you need to know for the GRE test. For the quantitative section, it has various subsections like Algebra, Geometry, Data Analysis, etc. which have all the theory which you need for the examination but the best part of this book is the AWA part. It has all the responses which will fetch you a score of 6,5,4,3 etc. So this gives you an idea as to what quality of writing ensures you a good AWA score which is vital. Keep in mind that the nature of this guide is to get you familiar with the style of the GRE and strategies for identifying patterns and managing your time. It is not intended to be a comprehensive prep resource, as it focuses little on practice problems. You will get to know the quality of writing required for a good AWA score. 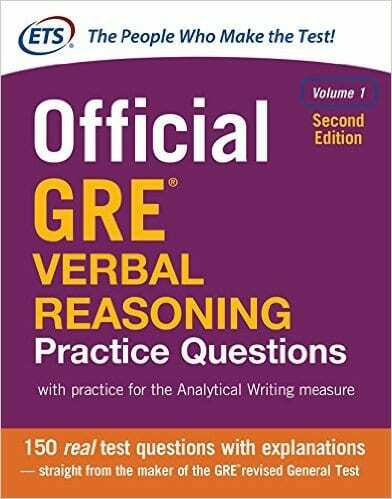 One of the best GRE prep books to prepare for verbal reasoning. 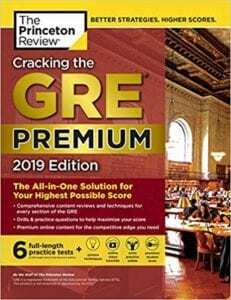 This GRE study guide from The Princeton Review is a great resource for students looking for a comprehensive study guide from a reliable source. This 2019 publication has the most up-to-date strategies and tips for tackling the GRE, as well as practice questions that represent all categories and difficulty levels. The Free GRE practice tests provided with this book are a great way to get yourself familiar with the style and scope of the GRE. 2 are found in the book and the other 4 can be accessed online. 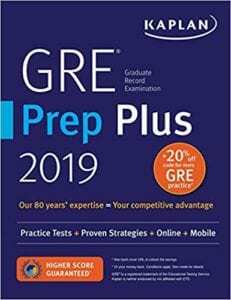 While it may seem a nuisance to have to go online to use some of the features in this book, you will find that taking practice tests on a computer is the best way to prepare for the real GRE. Adaptive exams are a unique experience and require strategies different to standardized testing, so the more exposure you have the better. 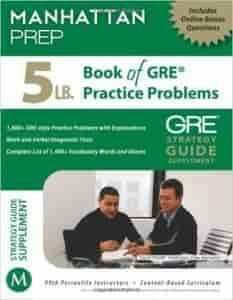 Best GRE prep book to learn strategies. The detailed explanation of fundamental Math concepts. Drills after new strategy are very helpful. It also includes 6 Free GRE practice test + online DVD with excellent advice on how to tackle GRE test and graduate school admissions. This GRE study guide by Kaplan is a pretty handy one when it comes to Verbal preparation, but the type of questions they have for quantitative portion are pretty easy. If the Quantitative section is where you feel you need to make your biggest improvements, this may not be the right prep choice for you. Getting a proper challenge from your test review is critical to scoring high on the GRE, so keep this in mind when deciding. Like some of the other options on this list, the practice tests included are much easier than what you can expect on the real GRE. Overall, with more affordable and challenging options on the market, you might consider another workbook OR check into one of Kaplan’s much more comprehensive and realistic review courses. This book has an excellent collection of GRE Vocab Flash Cards. The goal of this book is to drill down on the highest-frequency words that appear on real GRE tests, so it is great for maximizing both time and results. The cards include definitions, example sentences, pronunciations and synonyms: all of the qualities that make a great flashcard and help the vocab stick in your mind. Overall, Manhattan Prep has provided a great resource for students looking for quick help with vocab memorization. Keep reading, however, to discover another source for vocabulary learning which I think does an even better job of providing comprehensive study materials. This is a decent book that will teach you how to write test prep essay. You will be taught about how to think on both the side of an issue so you will get an accurate idea of how to write and formulate an essay from scratch. One negative of this book is that all the essays are written in the same style. So, you won’t be exposed to different styles of the essay. In GRE you will get marks for your style also. 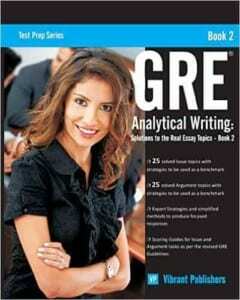 The book does not have different essays for various GRE AWA scores. This book also doesn’t get into detail about what AWA scorers are looking for. I hope you enjoyed our review of some of the best GRE prep books. You don’t need to buy all these books to ace GRE. Usually, 2-3 GRE books are more than enough. If you think any book should come with this list, or you need to review it by us, then do comment below. I just see the post i am so happy the post of information’s.So I have really enjoyed and reading your blogs for these posts.Any way I’ll be subscribing to your feed and I hope you post again soon. Hi there, thanks for the insight! Though before purchasing, wondering if all of these books offer the most up to date info/test prep tips? Yes, indeed these GRE books provide up to date information. Hello, i planned to take gre 7/8 yrs ago but did not. At that time i bought various books. Now i want to take gre in 2 months time. I need high score in quant. My basic in math is good but am slow with calculations. I have old books like barrons how to prep for gre 10th & 19th ed.ets practising to take gre 10th ed. Cracking the new gre princton review. Nova math bible & big book. I dont want to buy any more books. Will my old books suffice? Also i find barrons quant section to be tedious even though review says it very good. I have started quant prep with nova math bible & cracking the new gre princeton. Should i study barrons instead? Thank you. Thanks for sharing the GRE Preparation Tips, Guide lines and Study materials.